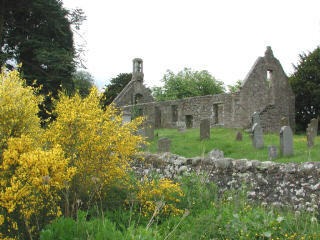 The estate in Peterculter of Dalmaik takes it's name from the old church at Drumoak. To find this old building follow the signpost off the A93 to "Drumoak Kitchens". Follow this road southward towards the river and you will see a sign to "Drumoak Manse B&B". This church site and burial ground has stood since around 1062. It is mentioned in a Papal Bull of 1157 as the church at "Dulmayok". The Rev John Glennie was minister here in the 1750's- 1760's before he took up a charge at Maryculter. The church fell out of use with the building of a new church in 1836. The turning point for the Old Church was the building of the "new" turnpike road in 1798. The church, by the River Dee, which had served the community for so many centuries was now, simply, too inconvenient.